After being engaged for nearly five years, Liz and Neil from England decided it was finally time to tie the knot. 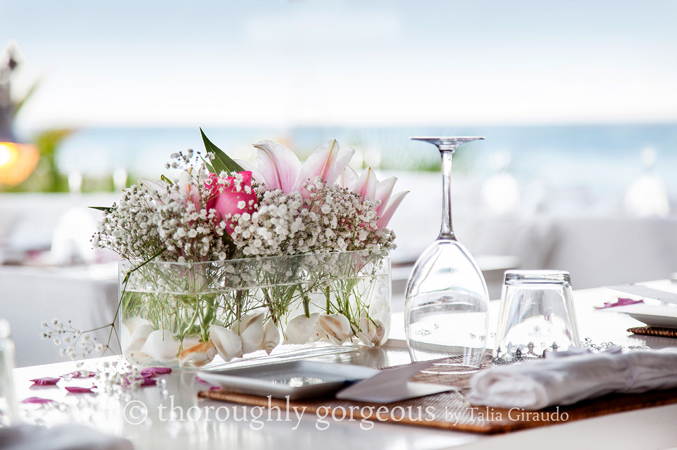 They opted for a beach wedding in Estepona, Spain where they could say their vows surrounded by the Mediterranean. 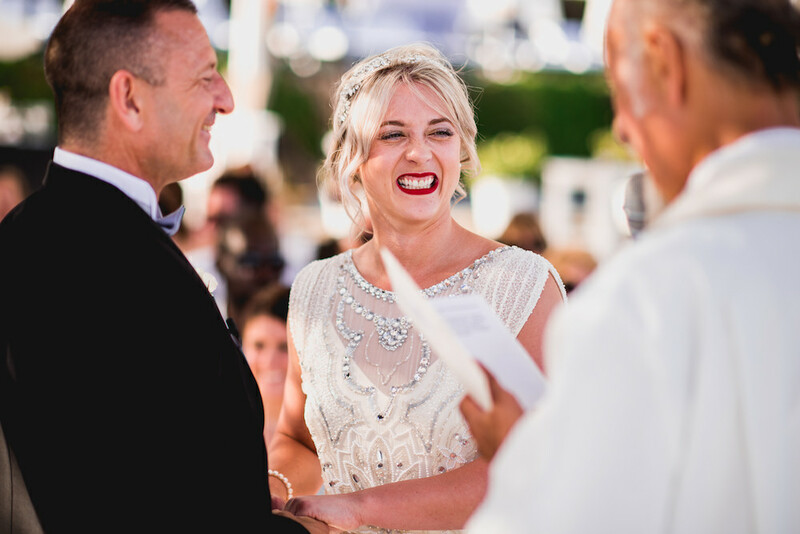 After deciding they wanted to hold their wedding in early June 2016, Liz and Neil told the team at Sunshine Weddings Spain that their dream wedding venue would offer both a relaxed beachside wedding and a party atmosphere for the evening. After viewing variety of venues they fell in love with a luxury beach club located in an exclusive area of Estepona, which is well known for its aesthetics and construction typically inspired by Bali. 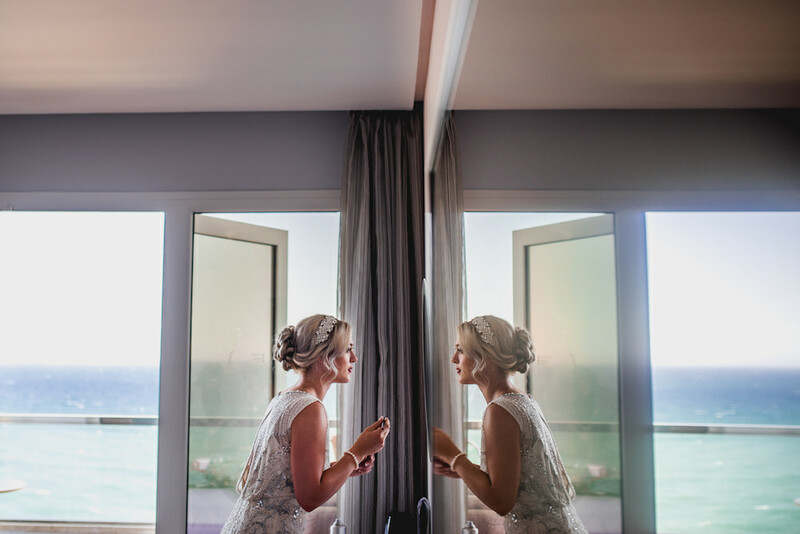 Boasting different spaces (beach, pool and restaurant) the deciding factor was the fact they could have their ceremony on a picturesque sandy beach, surrounded by views of Gibraltar’s famous Rock and the Moroccan Atlas Mountains. On the big day Liz looked as if she had stepped straight off the Great Gatsby movie set – she was seriously channelling Hollywood screen siren glam. Drawing inspiration from quintessential elements of the 1920s, her vintage style Jenny Packham wedding dresses encompassed Art Deco designs and jewellery-inspired beading. The bridesmaids wore complimentary Jenny Packham designs in a dove grey. Bridal hairstylist Alex continued the 20s theme with the hair but brought it up to date by creating a more unstructured do. A delicate Jenny Packham Art Deco hair accessory was the finishing touch. Liz did her own make-up, opting for a fresh, glowing complexion with subtle golden eye make-up. All that was left to do was to apply her statement red lip and she was ready to Charleston the night away. Liz wanted simple white flowers for her bridal bouquet, which florist Karen created, using white roses and gypsophila and the button holes for Neil and the groomsmen matched these. The couple opted for candles on the tables rather than flowers; as the reception would be in the evening they thought this was more fitting. A Special thank you Barney Waters photography for the amazing photos provided. Join us for Part Two when Liz finally meets Neil at the altar.